One of the best custom flags we've seen. The symbolism is dramatic and clever. The "L" for library looks like a person reading. So the viewer reads the "L" on the flag of the person reading. Gives off a great impression! Over the recent years, there have been discussions about the changing nature of libraries. With the creation and popularization of the Internet, information has now become more readily available making the typical trip to your public library unnecessary. In some cases, cities like Detroit are potentially canceling their library programs all together (click here). But what exactly are you losing by closing down public libraries? The wake of the internet is a vast desert of small businesses, social interactions, and public institutions. Convenient overhead cost puts local businesses at a strict disadvantage to the idea you can wait a couple extra days and get it for much less. Baseball is more fun to play online than on AstroTurf when you can be any star player you want to be with the click of a controller. And with a few mouse clicks, you can save yourself a trip across town to the library. No one operating from the old world can compete with that. Me: "Excuse me, but could you help me find a book about Flags?" Librarian: "Yes but first, are you happy with you cellular service? For a limited time, Sprint will sign you up for a 64 year contract for only $199 a month. All you have to do is give me a high five or you can give me a low five to close this window." Librarian: "I can not help you until you give me a low five." For many people, time is king. Saving time trumps saving jobs, saving the planet, even saving privacy. Instant convenience has made our old ways obsolete. With the passing of the CD comes the rise of the MP3. With the passing of a page bound book, comes an e-book reader. And the ramifications are seen in the class wars. The poor, who once enjoyed free access to information such as available job opportunities, now need a computer. While those that can afford technology live their life in a race car, completely unaware that the free internet and instant convenience has made information no longer free. For the guy without a computer or the user who has one. 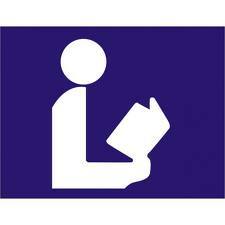 When I look at the public library flag, I don't just see an "L", I see a person reading a paper-bound book. I see an internal conflict between what has been done since the first written words to today. But I also see a grandchild saying, "Were you alive when people used paper?" That is what good custom flags do. They stand for something without actually saying anything. They guard the gate to a much richer subject. A nation stands behind a flag in this same way.